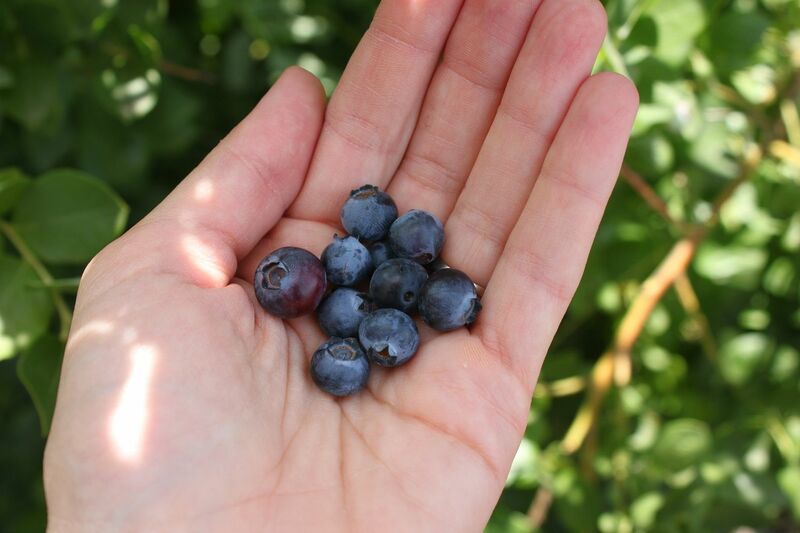 Something that has been on my summer bucket list for ever is blueberry picking. 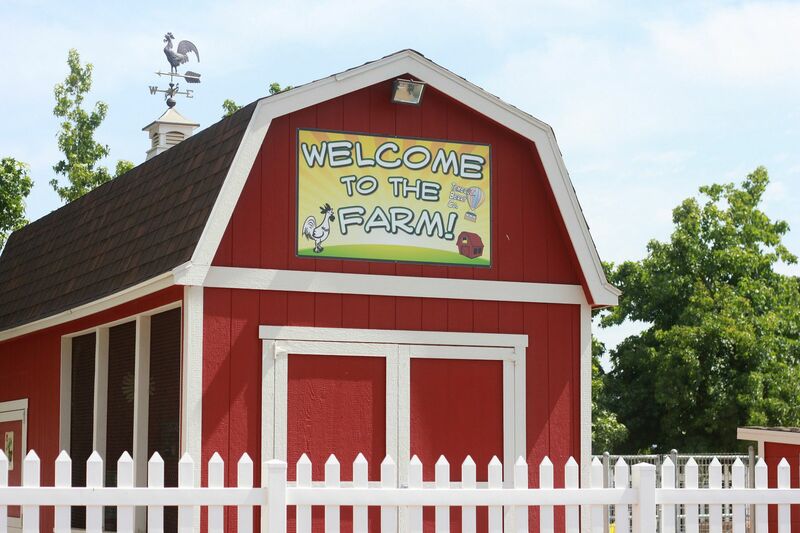 There is the cutest U-Pick farm less than 10 minutes from my house so I decided it was time to go. My awesome sister (aka Aunt Nat) came along with us and it was such a fun time! Max is at the perfect age to truly appreciate the activity and Ronin was in berry heaven since his favorite snack was in arms reach all around him. At this very moment I am restraining from typing he was "berry happy," but I just can't help it. At a few points Ronin was so excited he could hardly contain himself and would just let out happy little squeals. It was the cutest thing. I am pretty sure the boys ate their weight in blueberries by the time we left. 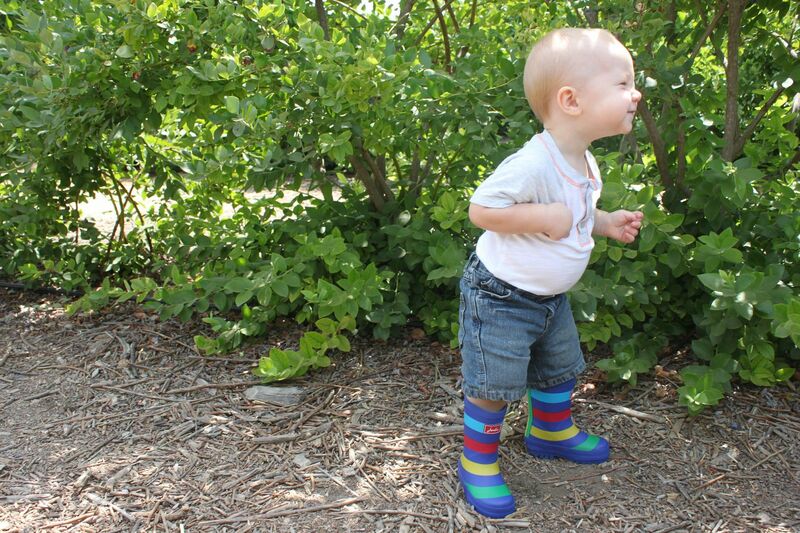 The cutest boy's rain boots c/o of Joules. They are perfect for gardening activities in the summer and rainy days in the fall and winter. I love them and so do my little guys! Such a fun day! If you have a chance to do your own berry picking I highly recommend you go! And now for giveaway time! Today's giveaway is hosted by Joules, which is an adorable shop full of colorful, cheerful clothing for babies, kids and adults. Joules is offering one lucky Delighted Momma reader any pair of boots you would like. You can pick a pair for yourself or a pair for the little person in your life. Visit Joules and decide which boots are your favorite. Women's boots here. Boys boots here. Girls boots here. Leave a comment below letting me know which pair you would like to win. Good luck the winner be selected at random and announced at the bottom of this post next Thursday. Congrats Urban Wife! You are the winner. love these rain boots! so fun!! i would probably choose the red striped ones for myself or the little yellows for my little dude. Oh, how fun! Berry picking is on my list too. I'd love those carrick muck boots. I need a new pair! Hi! I'd love to win this Navstrp Jnr welly boy boots for my son: http://www.joulesusa.com/Boys/Wellies/Jnr-Welly-B/Boys-Rain-Boot/Navstrp?id=O_JNRWELLYB|NAVSTRP Thank you! Looks like such a great time! I would love to take my kids. Your boys are soooo cute--I have two boys (around your boys ages) too! Blueberry picking sounds awesome. As much as I'd like a pair of boots for myself, I'd LOVE these for my older son! I also totally love the ones Ronin is wearing! 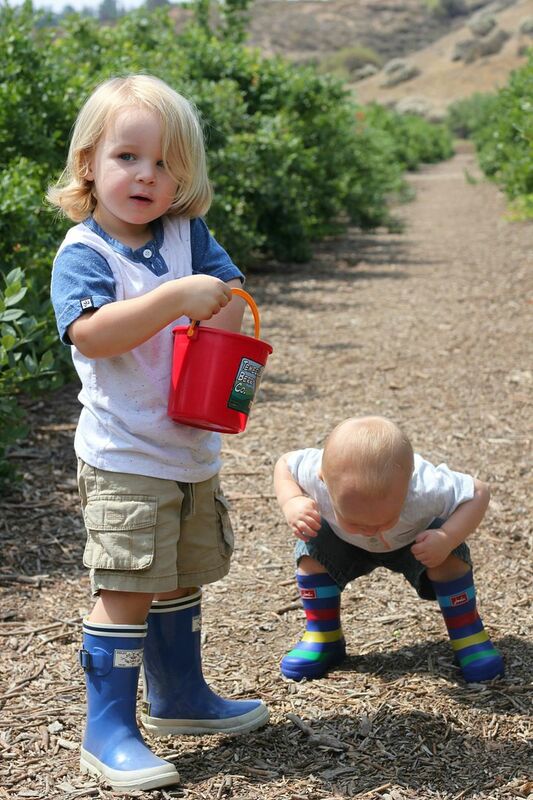 I love the carrick muck boots, and I like the seafarer ones for my little man! That looks like so much fun! I hope I can take my kiddies berry picking this season. They'd love it! As for the boots, I have two kiddies, so if I won, I'd take the ones with the tractors (at least I think they're tractors) for my son or the ones with horses for my daughter. Thanks!! Ah so cute! I'd choose the striped ones for my adorable niece! These are all so cute! I'd pick the Womens Fox Wellies. So cute! I would love the Women's Millie in black! The cute boots are actually the first thing I noticed in the top picture :) I would pick the Women's Fox Wellies. Perfect for gardening in Montana. LOVE the red seafarer women's rain boot! so cute! Adorable boots! I really like the Pink Stripe and Navy Floral! 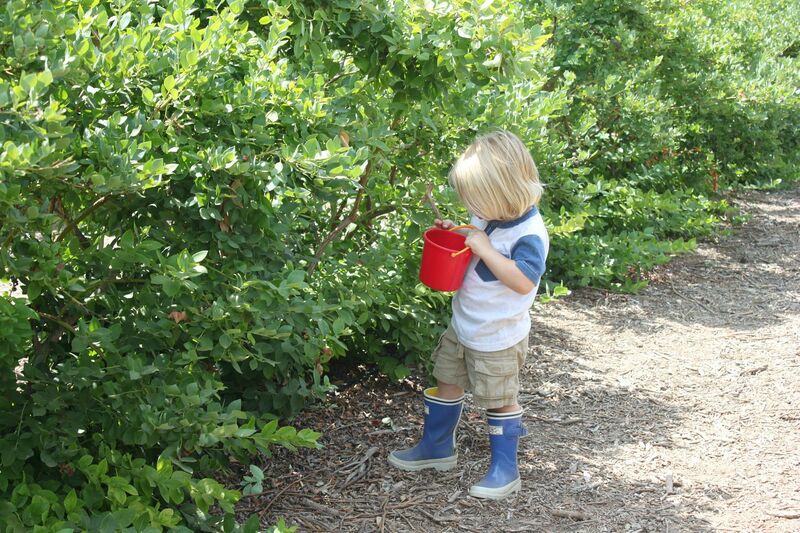 Glad you and your family had a great time berry picking! So fun! I love the Women's Navy Spot Welly boots! They are all so cute! I love the Evedon's or the posh welly's in pink for me! I'm torn between the Posh Welly's in Navy or the Navy Stripes! I love all the striped ones, but I'd probably go with the solid black posh welly, 'cause I'm boring like that. :) Super cute. Hi Lindsey, the red seafarer women's rain boots are SO cute! On a side note, I just started reading your blog and I love it!! You take wonderful pictures and the stories are fun to read. I even tried your paleo chocolate chunk pecan cookies this weekend. I've been eating paleo since last July and I've had the same results as you. Clearer skin being my favorite outcome. :) Anyway, I love reading your blog for new skin tricks, recipes, and photography inspiration! I've been needing a pair of rain boots! My favorite are the SEAFARER Nautical Rain Boots in Navy. Love the women's Nautical rain boots in red! I love the navy stripe boots! I love the unisex kids boots in blue! I love the green fox ones! I love the navy stripe boots. Love, Love, Love the Seafarer in Navy. Gorgeous! I would choose the Evedon Rain Boot. Such cute boots! I have lived in Washington state my whole life and have never owned rainboots, nuts right. I would love either the Posh in green or the pink stripes, for my little day I know without a doubt she would love the jr welly in green spots. Thank you for a chance to win! Posh Welly Women Plain Rain Boot Black! Love the Womens Navy EVEDON boots! The bow on back is really adorable! The welly wither color or the navy evedon. So adorable!! I love those rainboots. I love these! I would choose the blue Kids Plain Rain Boot for my little boy! I'd be selfish and choose for myself. We always put our littles first, right? :) I'd choose the Women's Pink Stripe Welly print rainboots. We live in the country in Michigan and so far this summer I've seen more snakes than I'm comfortable with. These would keep my toes safe and cute! *Anonymous about pink stripe boots and snakes is me...Melissa W.
Loving the navy ones with the red ties at the back, or the colorful green and pink flowery ones. So fun!! The Evedon is darling in any color! Fun! We don't have to go far to pick them here...we have several bushes in our very own backyard. Love the navy and white stripe boots!! I looooove the women's welly in the multi-stripe! Super cute! I love the women's yellow posh rain boots the best. I pinned my favorite item as well. my favorite are the black boots with the bows on the back!!! Oh those pink striped wellies would look fine and dandy in the Portland weather we are having!!!! I love these boots. My favorite are the tall bright yellow or tall navy and white striped with red. I've been following your site for a few weeks now. I'm new to paleo and am a mom and find your passion for life and food inspirational! And your boys are cuties! Loving the posh navy boots. So cute! I love the tall Welly Print in the Navy Stripe and the Green with the Foxes! 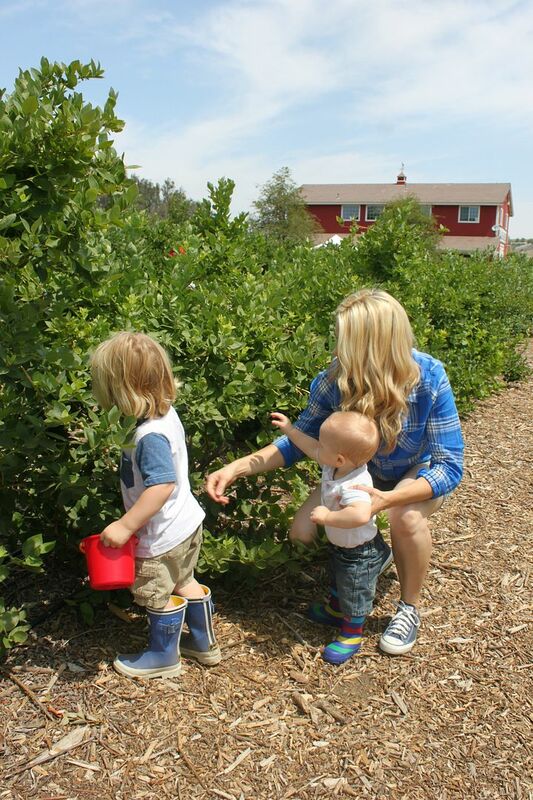 What a fun trip to the blueberry patch! You guys are too adorable. I like the Evedon women's premium rainboot! I love these boots and I don't know how I'd decide they are all too cute! The Green Foxes are adorable, such a great way to brighten up some gloomy weather! Would love a pari! I love the Evedon Premium boots! Thanks for all the inspirational posts. I'm paleo and a new mom and find you and your family uplifting! Thanks! oooooh my! I love the red stripe welly print! This post made me smile...it's been raining here all week and the sunny photos from the blueberry patch made my day :). Speaking of boots, this pair is my absolute favorite: Women's Evedon in Navy (with the cutest red bows!). I love the pink Posh Welly's! I'd love the pink spot ones! Loving the green with the foxes, how cute!! It is my fist time on your blog and love it! Sorry if you already answered this question before, but I was wondering if you could let me know what hair dye do you use and if you style your hair yourself and how. I'm in absolutely in love with your hair!! Would love to win one of the Posh Welly plain boots! My three year old and I absolutely love the JNR Welly Boys Rain Boot Navtrac! The kid is obsessed with tractors and heavy equipment. Gotta love it! This is a warm and happy picture. And I pinned those babies! Sweet boots! I really like the navy and red striped boots in the boys' section. I think they'd work well for a boy or a girl -- I'm sure my daughter would love them! We're planning a trip to Acadia National Park later this summer, which is blueberry heaven. I hope I'm able to get pictures of my daughter that are as cute as the ones you took! Thanks for posting -- as a new mom, I have loved following your blog. I really like the navy and red striped ones in the boys' section -- I think they'd work well for a boy or a girl! We are planning a trip to Acadia National Park in Maine later this summer, which is blueberry heaven. I hope that I'm able to get pictures of my daughter that are as cute as the ones you took of your boys! 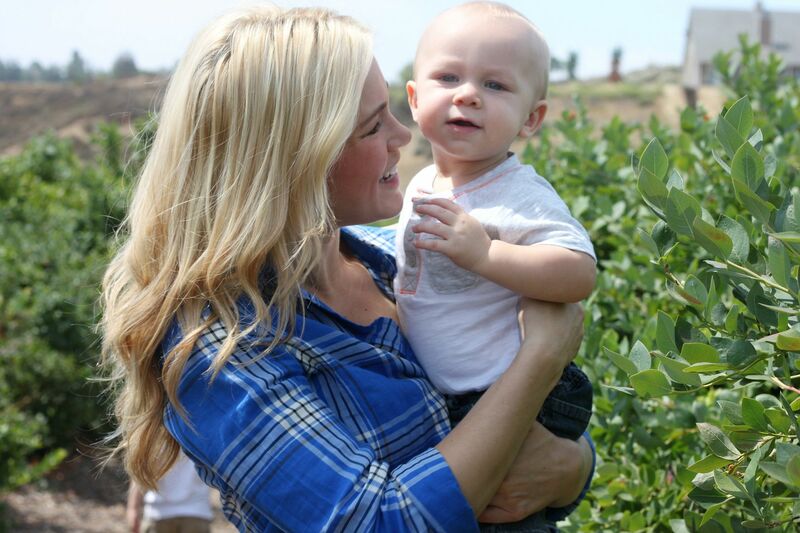 Thanks for posting -- I have really enjoyed following your blog since becoming a new mom. I would love the Green spotted boots for my little niece, they are adorable! I have lived through Wisconsin seasons (all of which include rainy days) without ever owning one pair of wellies! Seriously! I love the pink and navy stripe women's wellies. They are adorable! I love the Pinstripe Girls Rainboot! They were made for my girls! I would LOVE the Joules Posh Welly Women's Plain Rain Boot in Pink! So adorable. I pinned them on Pinterest! I love their Posh Welly Women's plain rain boot. Those in yellow would make any rainy day a little more cheerful! I would choose the Welly fox print ones! They are so cute! I love the cant spot for Women! Love, love the pink spots!! Ooh! The Navy Stripes are so great! I LOVE the navy Floral!! i really like the Womens Wellibob, Navydog, looks cute and very practical. All of their boots look so sturdy and well made. Thanks for introducing me to the site. I hope i win! What a fun day!! We have strawberry picking here and I love it!! I LOVE the Evedon boots in red or the Welly Floral print. So cute!! I plan to do strawberry picking this year yummy! LOVEeeee the pink posh welly, I have been eying a pair of rain boots like this! I would LOVE to wine the Womens Navy Stripe rain boots. They are so cute! Ooh la la! Those boots are perfect! And I can live with that price! Yay for the giveaway, if I win i'd like to have the unisex seafarer..my 9 mos old started walking and he can use a pair =)thanks for the giveaway! love the girls welly in bluflor! I love the Navydog Wellibobs they are just adorable. 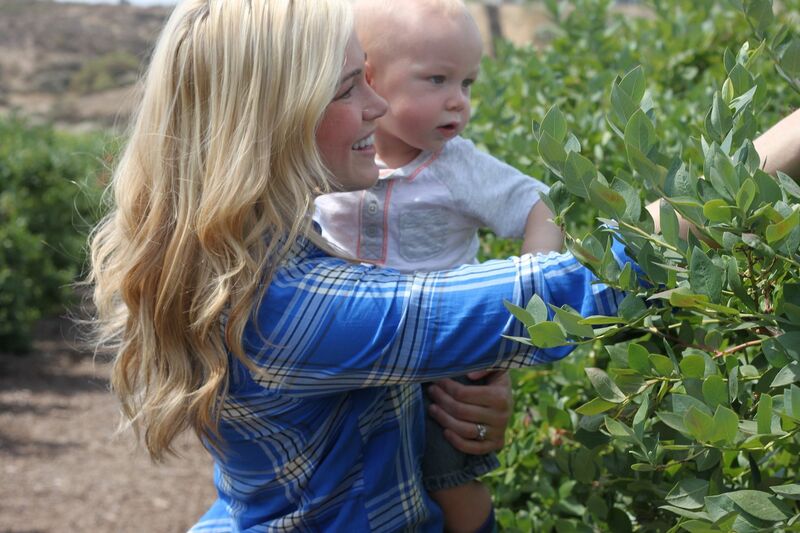 And your boys picking blueberries are adorable. I love love LOVE the Navy Floral Welly print Womens' Rain boot. What a mouthful of a name too!